Fall 2015 | A $1 million grant from the W.M. Keck Foundation of Los Angeles will help UD materials science researchers explore a new idea that could increase the efficiency of commercial solar cells by 25 to 30 percent. While the initial focus of the three-year project will be on improving solar energy harvesting, the team also will use the grant to explore biomedical applications, such as medical imaging and the more efficient delivery of chemotherapy. Matthew Doty, associate professor of materials science and engineering and associate director of UD’s Nanofabrication Facility, leads the team in designing a new kind of semiconductor nanostructure that will act like a ratchet, turning low-energy colors of light, such as red, into higher-energy colors, like blue or green. It will absorb two red photons, one after the other, to push an electron into an excited state when it can emit a single high-energy (blue) photon. The amount of light absorbed and energy emitted by the structures could be customized for a variety of applications, from light bulbs to laser-guided surgery. The UD team has shown theoretically that their semiconductors could reach an “upconversion” efficiency of 86 percent, which would be a vast improvement over the 36 percent efficiency demonstrated by today’s best materials. These nanostructures will be so teeny they can only be viewed when magnified a million times under a high-powered electron microscope. Doty’s co-investigators include Joshua Zide, Diane Sellers and Chris Kloxin, all in the Department of Materials Science and Engineering; and Emily Day and John Slater, both in the Department of Biomedical Engineering. While photon upconversion isn’t new, the team’s approach to it is. They are developing new semiconductor structures containing multiple layers of different materials, such as aluminum arsenide and gallium bismuth arsenide, each only a few nanometers thick. This “tailored landscape” will control the flow of electrons into states with varying potential energy, turning once-wasted photons into useful energy. One of their techniques is molecular beam epitaxy, in which nanostructures are built by depositing layers of atoms one at a time. Each structure is tested to see how well it absorbs and emits light, and the results will be used to tailor the structure to improve performance. The researchers also will develop a milk-like solution filled with millions of identical individual nanoparticles, each one containing multiple layers of different materials. The multiple layers of this structure will implement the photon ratchet idea. They envision a future upconversion “paint” that could be easily applied to solar cells, windows and other commercial products. The same upconversion technology used to harvest more energy could also help the researchers improve a number of diagnostic tests and medical treatments, ranging from CT and PET scans to chemotherapy, which rely on the release of fluorescent dyes and pharmaceutical drugs. The team hopes to develop an upconversion nanoparticle that can be triggered by light to achieve the controlled release of drug therapies deep within diseased human tissue. By minimizing the laser power required, the team believes peripheral damage to normal tissue could be reduced. This prestigious $1 million grant from the Keck Foundation underscores the excellence and innovation of our University of Delaware faculty. 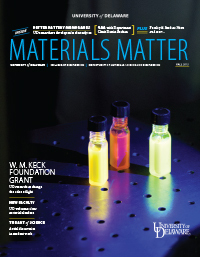 This story appeared in the Fall 2015 issue of our research magazine, Materials Matter. Catch other research stories in the latest issue.